Well done, ladies. Now report to my cabin for your scurvy checks. But no matter the age, Halloween has always been tinged with an air of the sinister. The supernatural. The unknown. 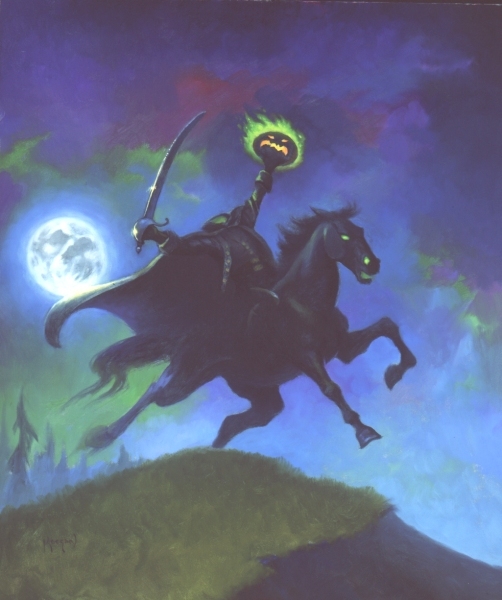 Which brings us to the Hessian of the month for October: The Headless Horseman. While most don’t realize he’s Hessian, he’s doubtless the most prominent Hessian in the American psyche. 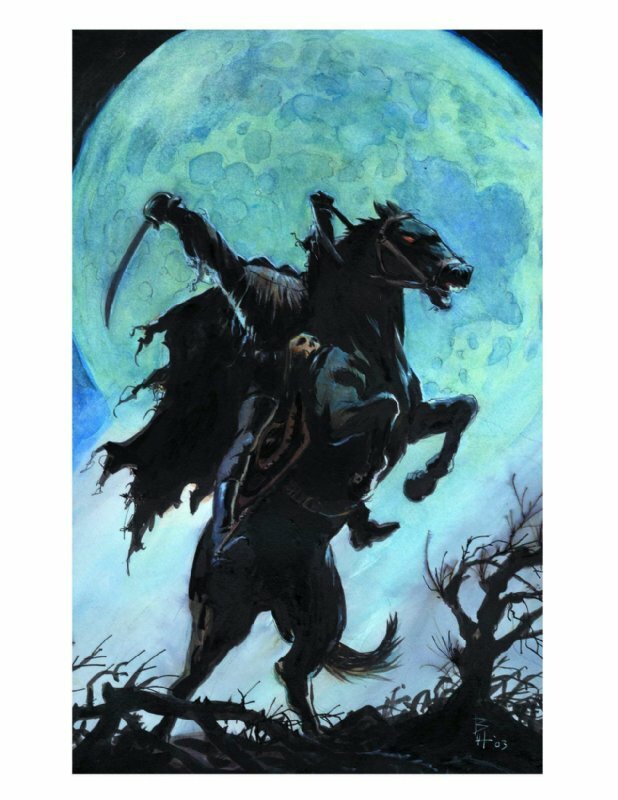 The main antagonist in The Legend of Sleepy Hollow, a 1820 story by Washington Irving, his story is a natural fit for the Halloween season. He even comes with a pumpkin! 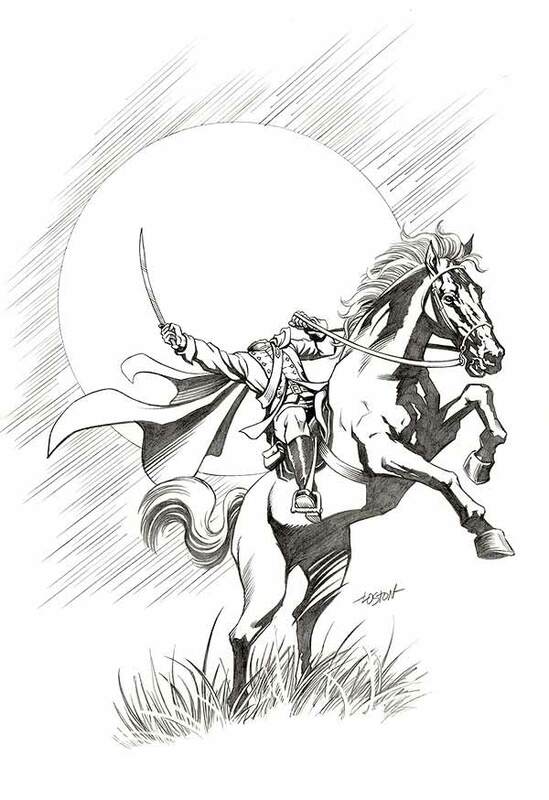 “The dominant spirit, however, that haunts this enchanted region, and seems to be commander-in-chief of all the powers of the air, is the apparition of a figure on horseback, without a head. It is said by some to be the ghost of a Hessian trooper, whose head had been carried away by a cannon-ball, in some nameless battle during the Revolutionary War, and who is ever and anon seen by the country folk hurrying along in the gloom of night, as if on the wings of the wind. His haunts are not confined to the valley, but extend at times to the adjacent roads, and especially to the vicinity of a church at no great distance. Indeed, certain of the most authentic historians of those parts, who have been careful in collecting and collating the floating facts concerning this spectre, allege that the body of the trooper having been buried in the churchyard, the ghost rides forth to the scene of battle in nightly quest of his head, and that the rushing speed with which he sometimes passes along the Hollow, like a midnight blast, is owing to his being belated, and in a hurry to get back to the churchyard before daybreak. Surprisingly, my father introduced me to the legend. I say “surprisingly” because he has always been a history-biography-western guy. 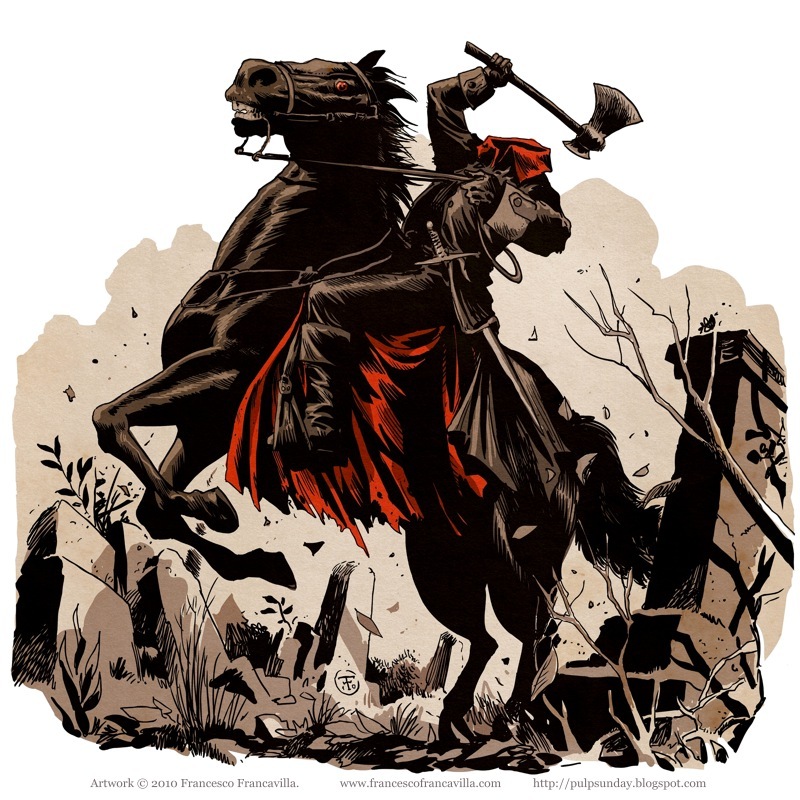 There wasn’t much overlap in the books he and I liked, seeing I was always seeking out comics and books featuring monsters, superheroes, wizards and dragon-slaying knights. But the Horseman bridged the gap between our tastes. 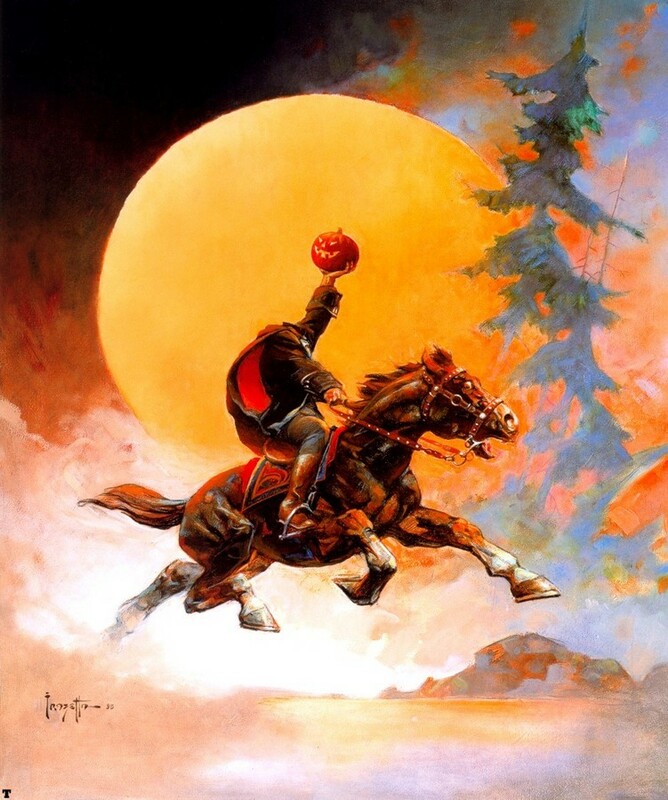 The Headless Horseman is a unique American story. It’s old enough to have been around “forever” (at least in American terms) but specific enough that the details remain pretty fixed. Despite the common elements, there’s plenty of variations in how he’s depicted by artists. Or a fiery, blustery character. Or large and prominent, standing tall astride his destrier. The Horseman can even appear, dare I say it, contemplative. 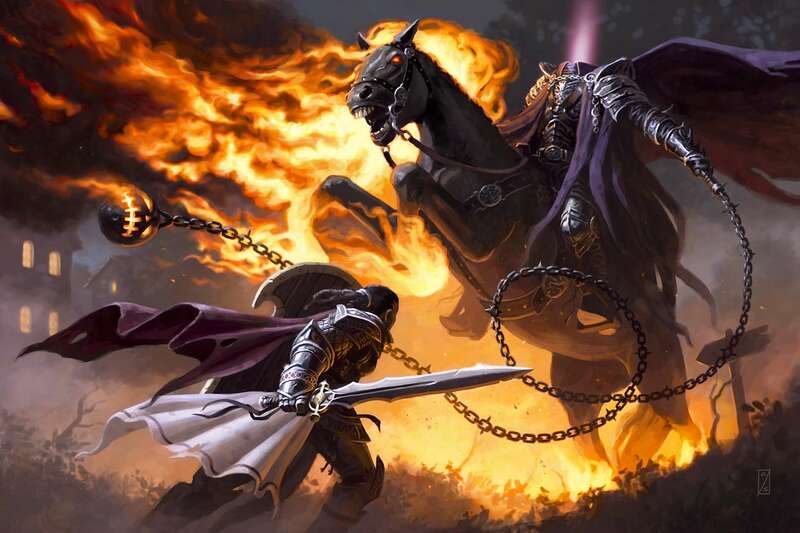 Or he can be accoutered as the grandest of knights, majestic in his terrible ferocity. He’s as essential to the Halloween pantheon as Dracula and Dr. Frankenstein’s monster. Dracula has his fear of crosses, Frankenstein’s monster has his neck bolts. 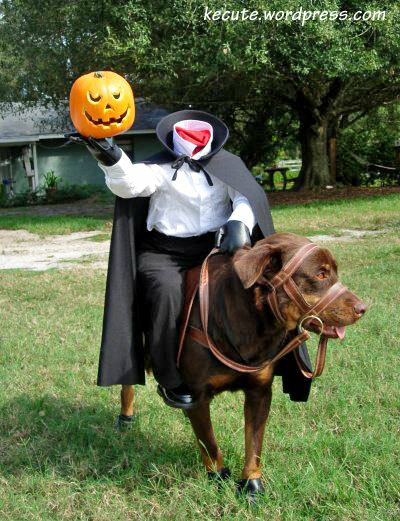 The Horseman has his great steed, sword or axe, pumpkin, and never-ending search for his lost head. If the art is anything to go by, he often conducts his searches by the light of the full moon. And, he makes a hell of a dog costume. 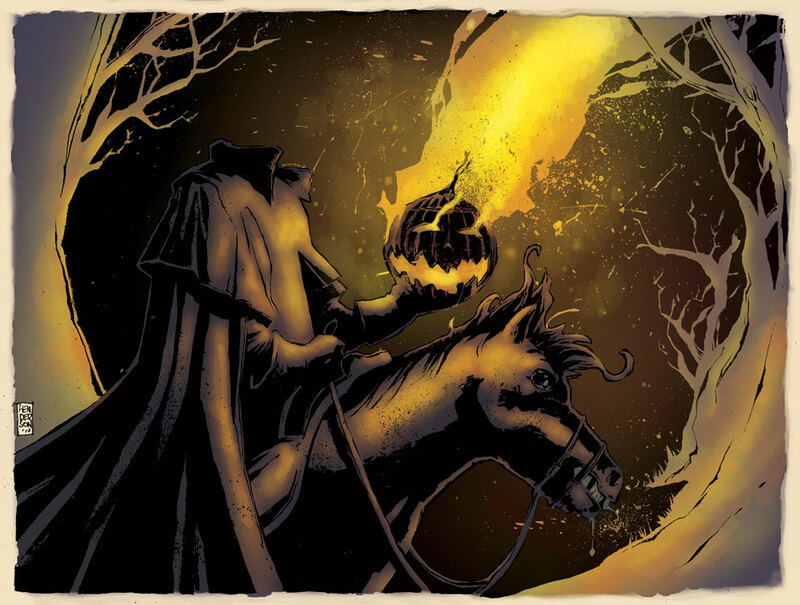 The appeal of the horseman, as with all of Halloween, is simply this: the world is a much more interesting place with some mystery in it. Irving’s story has endured precisely because it does not spell out the answers. 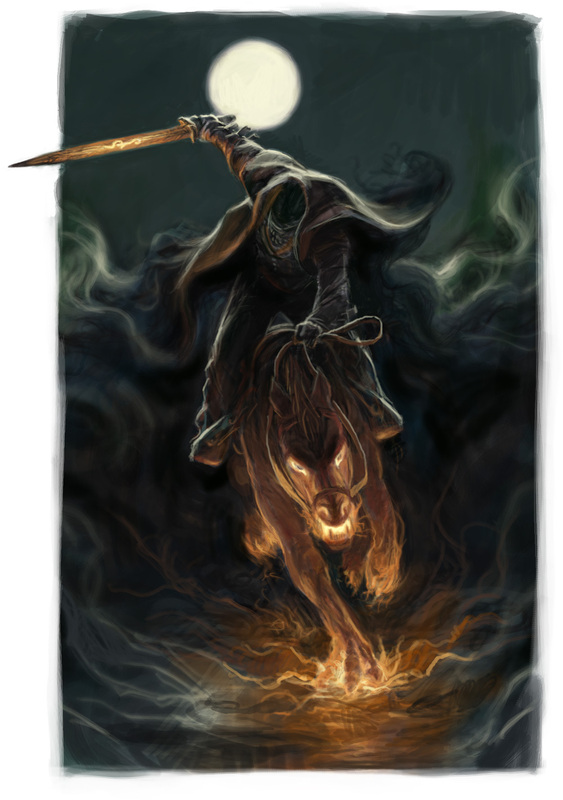 It’s ambiguous as to the existence of the Horseman, and if the Horseman got Ichabod Crane, or Brom Bones drove him off. As it should be. Halloween revels in what’s just out of reach and just out of sight; the things we don’t quite understand just beyond our perception. Those sinister hidden things remind us that we’re part of a larger world, and sometimes the world doesn’t conform to our whims and wishes; indeed, many times, the world moves on, not caring one whit for our wishes or desires on the matter. 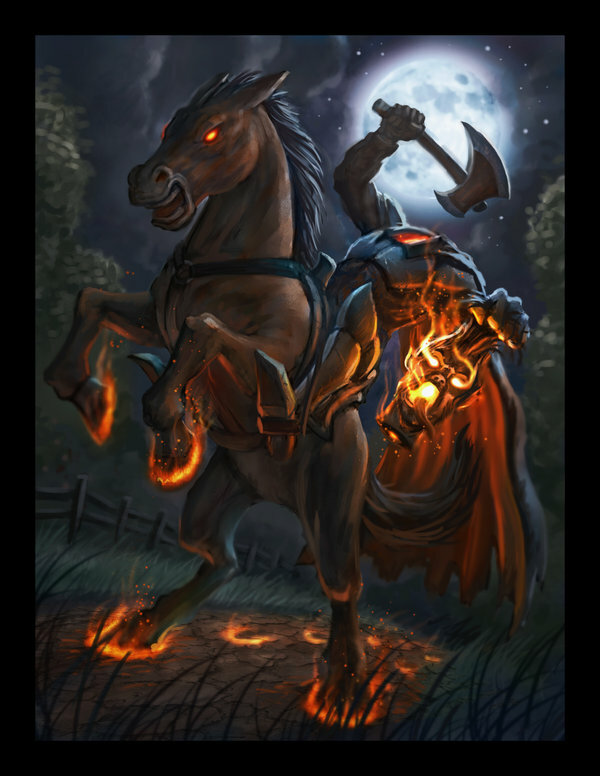 Just like the Horseman, who’s motivations and methods are a puzzle, but one cannot impugn his persistence. At least, I cannot. 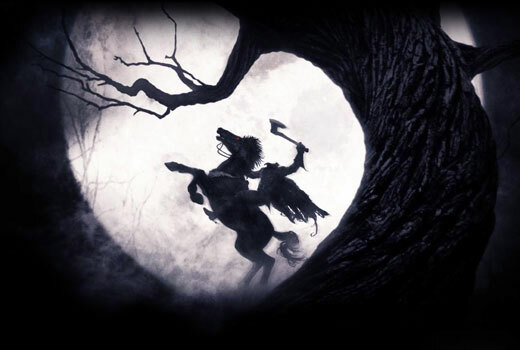 Because no matter what else has occurred in my life, the Horseman shows up every fall. When the leaves start to change and the nights get crisp, he appears from the dark corners of my mind, scouring the countryside for his lost head (or possibly others’ heads?) reminding me that I don’t have it all figured out, that this, too shall pass, and the seasons will keep turning. But mostly he reminds me that there’s still some magic in the world. It’s just out of reach and just out of sight, but sometimes, like the Horseman, it slips into sight, allowing itself to be perceived for me to draw whatever truths I can from it. 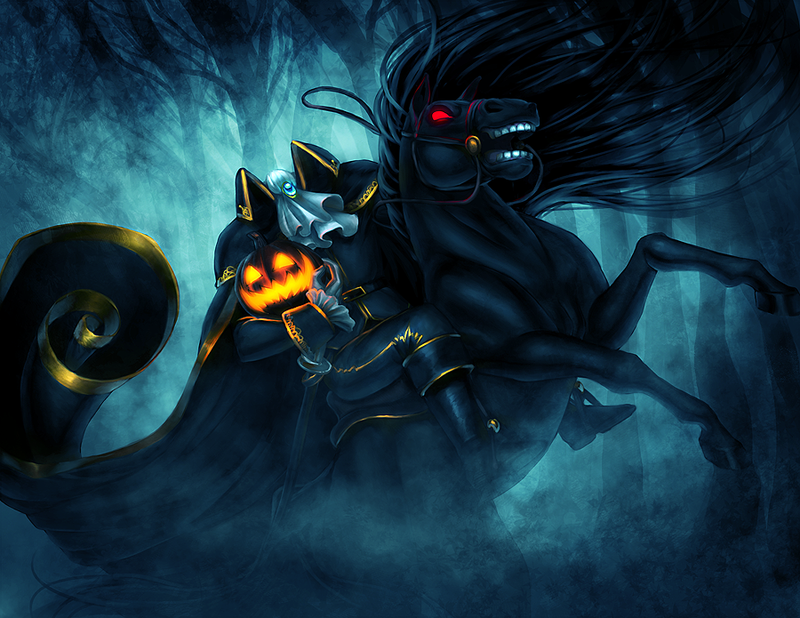 So here’s to the Headless Horseman. 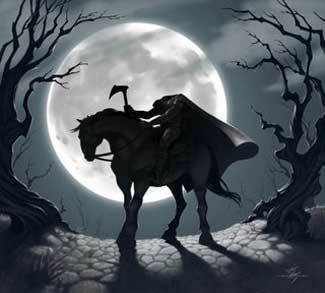 May he never find his head, never cease his midnight rides, and keep the mystery alive. Our world certainly needs its heroes. But a hero needs to be humble, and nothing is quite so humbling as a ghost that cannot be vanquished and cannot be deterred from his errand.